See the world as your arcade. In the movies going to the arcade is romantic. It’s after school and you get your group of friends together to go to a to a hole in the wall to play video games. Maybe one person gets a high score. They’re proud of it-- after all, they’ve been working on getting better at that game for a couple days; then another person beats him. They play it off cool but at that moment a rivalry is born, and from then on every time they stand in front of the machine preparing to face off your group of friends gathers around. The tension, the highs and lows, echo throughout the room and the atmosphere feels _ alive _. There is an important part of gaming that’s kind of been neglected, the social gathering aspect. The ability of games to bring people together. We aim to expand mobile games into augmented reality, with the goal of implementing QR scanning and place codes in various communal areas to enable users to experience arcade games together. We found AR to be an exciting opportunity to apply a developing technology on old simple forms of entertainment and reshape how we game, but also provide another method through which people can interact with one another. The hope was to implement QR scanning, placing codes in various communal areas, allowing users to experience AR through easy to pick up mobile games with others, pushing the technology and interest for AR forward while encouraging more social gaming. Unlike Pokemon Go, we would want to have a variety of simple games that are tied to unique QR codes that once scanned, would start the game. 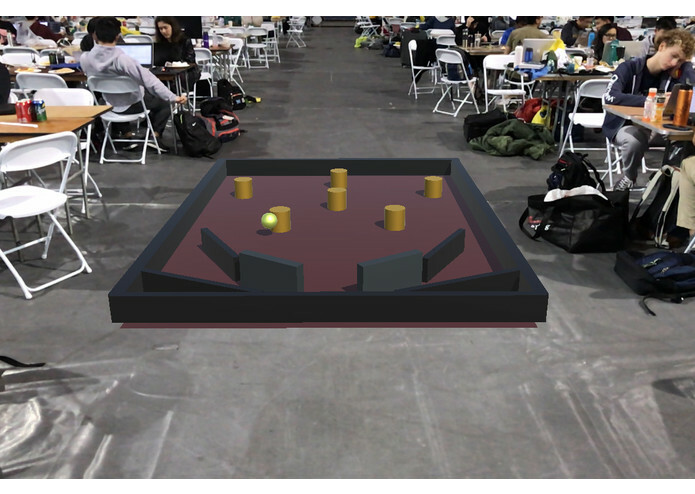 Although we weren’t able to apply this aspect of our project, we looked into image anchoring through ARKit, a newly released update to the AR application, and using images to trigger and orient our games, instead of QR codes. Multiple users would be able to scan the same code and experience exciting technology in a simple way, together. This app augmented reality into your gaming space. ARcade lets you play pinball in augmented reality. We built this using Unity’s game engine and Unity’s ARKit Plugin. We first built all the different aspect of the game like the barriers, paddles, and the ball. Then we added functionality to those parts such as rotation of the paddles, and bounce feedback from the barriers. 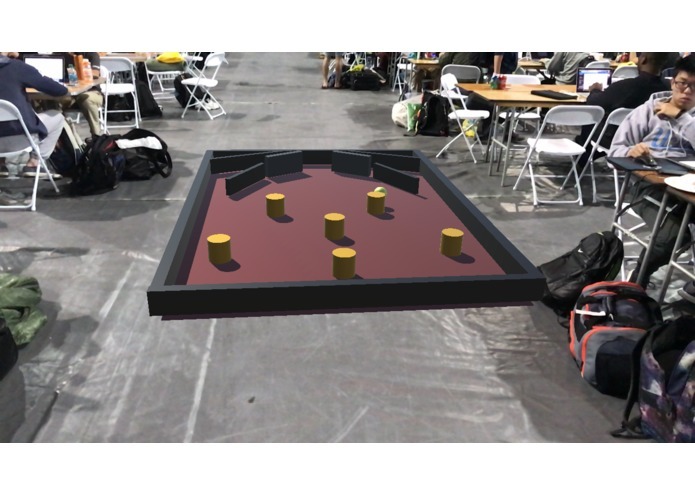 We initially thought about creating this with just Apple’s framework, ARKit, however, dealing with how the different parts interacted, like the ball, the walls, and even gravity, proved to be difficult. We tackled this problem by using Unity’s engine in conjunction with their ARKit plugin. Smaller problems included members unable to develop the code and running it on a physical phone. The biggest challenge is the learning curve for learning a completely new language-- most of us didn't know Unity or iOS at first so we learned as we went. We’re proud of our working prototype, the result of our countless hours of effort planning and learning (and debugging), and building up the determination to face the challenges in designing the product and implementing the mechanisms involved. We’ve learned a ton of different technologies when creating this hack: Unity, C#, Swift, and ARKit. Not only did we learn iOS development and game development, we learned how to interact with people whose skill set exceeds ours for help. We learned a lot. 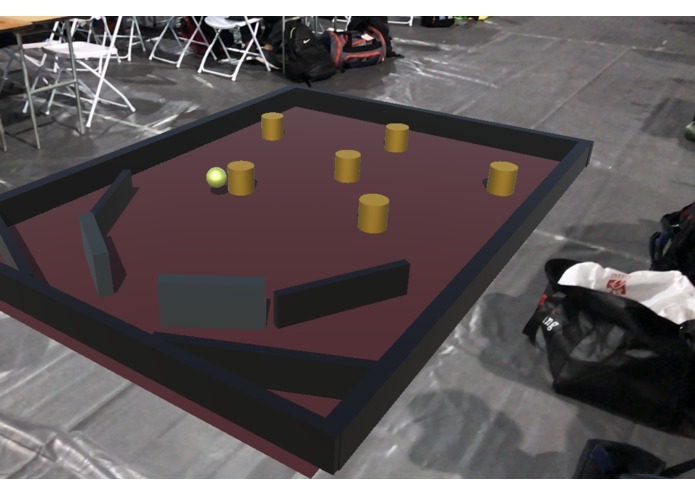 Displayed the model using AR Kit, placed the model using ARKit, scaled model down with Unity, checked ball physics with different scale in C#, refined game physics in C#. Plane mapping in ARKit (not used). Attempt to attach model to plane, which proved technically difficult as ARKit doesn't use depth sensors. Learned iOS, ARKit, and Unity on the spot. I helped develop the game physics and logic in Unity, allowing us to easily display the game in AR using Unity's ARKit. 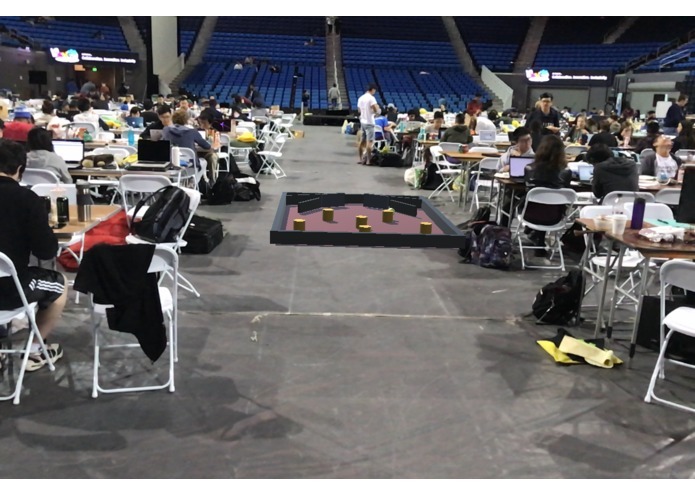 I don't have much experience in Unity, but I was able to learn a lot about the platform over the course of the hackathon. I also attempted to convert our game into a multiplayer game, but it proved to be more challenging than anticipated, so it is unfinished. I helped out with debugging, running the game onto a physical device and the progression of the project.